I'll tell you, I've been fortunate of late. Looking back over my recent posts, I've copped to being happy, pleased, and/or delighted more than a few times, not to mention once vowing (threatening?) to kiss the entire EQMM editorial staff. Today, though, happy just ain't going to cut it. Today I'd need to coin another word to describe how freaking ecstatic I am (see title above). I'm elated (thrilled, overjoyed, etc.) to announce that, as of 11:30 this morning, I am officially represented by Jennifer Jackson of the Donald Maass Literary Agency. As well as being an absolute delight thus far to talk to, Jennifer represents a slew of talented authors in a wide range of genres, including Jim Butcher, author of the bestselling Dresden Files series, as well as award-winners Elizabeth Bear and Jay Lake, and Derringer nominee C.M. Chan. And on top of it all, she somehow finds the time to run a widely read blog that is without a doubt one of the most valuable sources of insight and information available to any aspiring author. More important, though, than the fact that she's immensely qualified, is the fact that I couldn't imagine a better person to represent The Angels' Share (or, for that matter, the next book, or the one after that). Finding an agent isn't easy; finding the right agent is almost too much to hope for. Or, rather, it was. I just received word from the ever-charming Sandra Ruttan that my short story A Simple Kindness has been accepted to appear in the winter issue of Spinetingler Magazine, due out January 2008. The issue is being guest-edited by Jack Getze, so thanks to Jack and Sandra both. I've long been an admirer of Spinetingler, and I couldn't have asked for a better home for my story. Oh, and Spinetingler is a Canadian publication, which means I've officially gone international. Now I'm no mathematician, but it stands to reason I've just accomplished 1/3 of my ultimate goal of heading up an international crime syndicate. 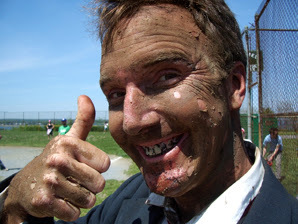 Recently, I read a post on an agent’s blog warning against mentioning that the novel you’re querying is your first. Why? “Because, in my opinion, first novels are not very well written.” Though I understand his point (and he’s doubtless got mountains of partials to back it up), I’m forced to wonder just what it means when you say a novel is your first. 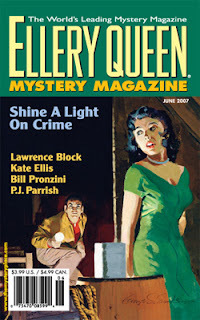 Though The Angels' Share is my first novel, my short story “The World Behind” was recently accepted by Ellery Queen’s Mystery Magazine to appear in their Department of First Stories, June 2007. Yep. I said it. My first novel. And it’s true, too, but not in the way that the afore-mentioned agent is assuming. The Angels' Share is the first novel I’ve completed. It’s the first novel-length work I’ve liked enough to finish, polish, and submit. And believe me, polish I have. But it sure as hell isn’t my first attempt. Before I sat down to write The Angels' Share, I spent a year slogging away at another novel entirely. I had no idea what I was doing, and it showed. Eventually, I wrote myself into a corner, and it’s a damn good thing. You see, I learned a ton while writing that book, and one of the things I learned is to listen to your instincts. My instincts were screaming “THIS IS THE OPPOSITE OF GOOD,” and they were right. So, humbled, I regrouped and set out to write something new, applying the lessons I learned during that first ill-fated project. That something new wound up being The Angels' Share, a book I’m immensely proud of. So yeah, The Angels' Share is my first novel, but don’t hold that against it. It’s worth noting that my prior attempt wasn’t technically my first whack at writing a novel, either. See, in high school, I got it in my head that I could write me a book, and I set out to do just that. I bought a nice, new notebook and started writing. No plot, no outline, no idea what in the hell I was doing. I was probably fifteen at the time, and solidly in the thrall of Neuromancer. The result was a near-future dystopic crap-pile of a book. Or, to be more precise, about 37 handwritten pages of a near-future dystopic crap-pile of a book. I’m pretty sure the whole affair ended with me throwing it out in frustration, and thank God. The last thing I need is for anyone to see that.